You may recall this item – picked up in a flea market in England . 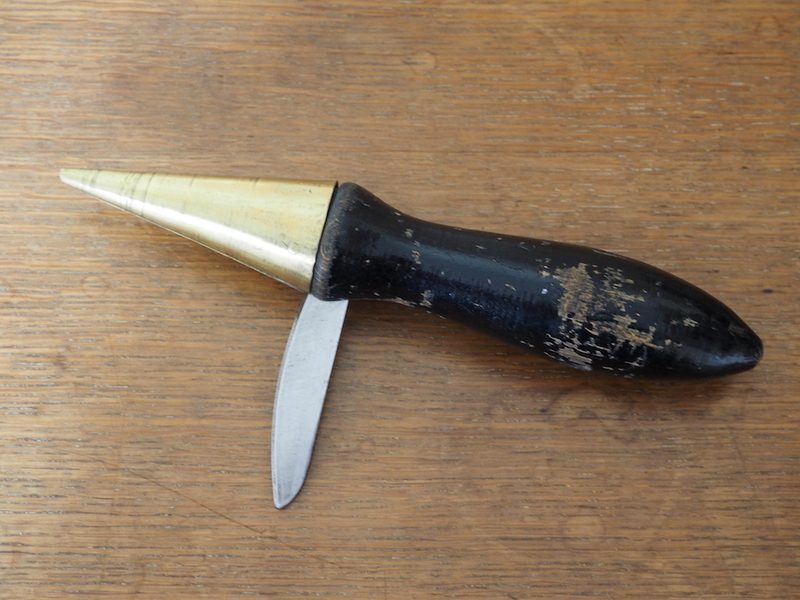 A brass cone shaped top with a pivoting ‘knife’. The cone shows signs of rotational wear. The ‘knife’ is not sharp. The image at left was provided by Martin Donnelly of MJDtools.com – if you have not been to Martin’s site is is well worth a visit. according to Gadgeteer of 101 forgotten Gadgets it’s an apothecary cork borer sharpener they were used at a time when medicines were very often mixed for a specific patient, and in the days before screw cap bottles, Apothecaries, Pharmacists, and Doctors would make their own cork stoppers to fit into the bottles in which their medicines were supplied. They made their own cork stoppers to size by pressing a cork cutter into a sheet of bark from the cork oak tree. … the majority of which are grown in Portugal. The bark is stripped from the tree every 10-12 years but surprisingly this doesn’t harm the tree; it just grows some more bark which is harvested again and again, up to 12 times in the life of a single tree. This tool was used to sharpen the tools that cut out those cork stoppers. 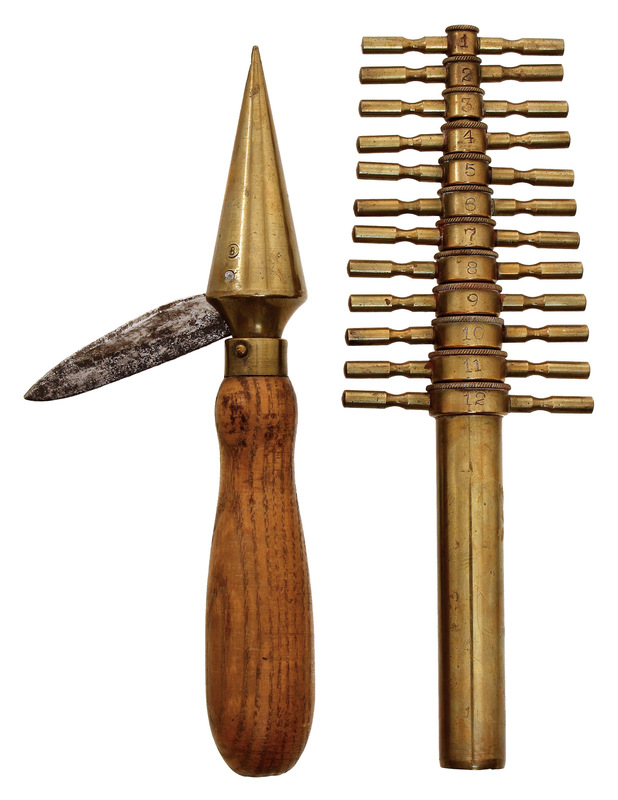 Cork borers come in a number of different sizes and are like tubes with one end sharpened. Over time and constant use, the cutting edge of the cork borers begins to dull and requires sharpening. This Apothecary cork borer sharpener consists of a wooden handle with a brass cone on the end. There is a not very sharp blade set into the cone which when opened folds right back into a slot in the handle at about a 135-degree angle. When not in use the blade folds into the cone. To use it you insert the brass cone into the borer, the blade is then brought forward to rest on the edge of the borer. Thumb pressure is applied to the back of the steel blade which when rotated sharpens the cutting edge of the cork borer. The total length of the tool is 7 ½ inches (19 cm). The blade is approximately 2 ½ inches (7 cm) long. When corks dry the shrink, not expand. That’s why wine bottles are laid on their sides. Thanks George for your interest in my site. sorry for the VERY long delay in answering. yes wine bottle are typically laid on there sides, although many bottles these days have screw caps and as far as I can tell it does not effect the flovour of the wine but then I am no connoisseur – just know what I like!